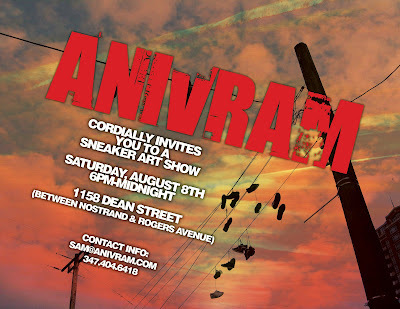 So we are now about 10 days away from the Anivram Sneaker Art show in Brooklyn. Everything from pieces of art to custom sneakers will be there, along with drinks and refreshments. As the flyer says, its going to be held at 1158 Dean Street between Nostrand and Rogers Avenue. I will be there, as well as Sam and a lot of different artists. Support! Its completely free to get in, and its sure to be a blast! If you have any questions, the contact info is on the flyer.